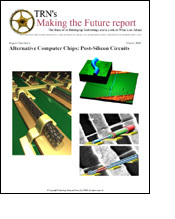 This report examines the current state of research into alternative computer chips, organizes key issues, puts them in context, and succinctly explains how the technologies work. Research into alternative computer chips aims to answer the question of what comes after silicon. Many researchers are pushing the limits of existing technology to keep Moore's Law on track, and many others are exploring new ways of making chips, including the use of nanotechnology and spintronics. Still others are exploring radically different types of chips altogether, including cellular automata and neural computing. The report includes an executive summary, a list of 13 developments to look for as these cutting-edge technologies take shape, and a section of 16 researchers to watch, including links to their Web pages. It also includes a quick tour of 26 recent developments in seven areas and a section of 21 in-depth news stories from TRN about alternative computer chips and related technologies. The stories are organized into seven categories: today's technology, nano logic, nano devices, nano fabrication, molecular devices, spintronics and alternative approaches. TRN's Making the Future reports contain live links, and can be read on a computer, printed and archived. Buy the the Alternative Computer Chips report for $89.
. You will receive download instructions via email. Take a look at all available Making the Future reports. View a four-page sample of the Making the Future report (pdf).